Important: animals with disease may show one or more of the signs below, but disease may still be present in the absence of any signs. EXOTIC — has not been officially reported in the Asia–Pacific region under the NACA–FAO–OIE quarterly aquatic animal disease reporting program. Proliferation of the parasite, leading to systemic disruption of connective tissue and epithelial cells, is generally associated with water temperatures above 20°C, when pathogenicity and mortality are most prevalent. It appears that low salinity (below 9 ppt) prevents clinical disease caused by infection with P. marinus. Acclimatising oysters to low-salinity waters is used as a management technique to avoid the effects of higher water temperature. The American oyster can eliminate viable P. marinus in faeces before dying, suggesting a possible transmission medium. Mortalities of up to 95% of C. virginica have been observed in the second summer following transfer to a disease enzootic area. Levels of infection have been found to increase during spawning and under the stress of oxygen depletion. 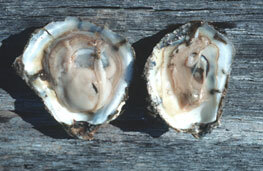 Prevalence and intensity of infection are greatest in oysters more than one year old and at depths greater than 90 cm. Exposure to pollutants will increase the prevalence of infection. The differential diagnostic table and the list of similar diseases appearing at the bottom of each disease page refer only to the diseases covered by this field guide. Gross signs observed might well be representative of a wider range of diseases not included here. Therefore, these diagnostic aids should not be read as a guide to a definitive diagnosis, but rather as a tool to help identify the listed diseases that most closely account for the gross signs. The clinical signs of infection with P. marinus are similar to those of infection with other Perkinsus spp (ie occasional pustules in soft tissue, pale digestive gland, poor condition, emaciation, shrinkage of mantle and retarded growth). It is therefore difficult to make a presumptive diagnosis based on gross signs alone. The knowledge that P. marinus affects primarily oysters, rather than abalone as does P. olseni, provides some level of differentiation. However, given the susceptibility of other molluscs to Perkinsus spp, further laboratory examination is required. Because of uncertainty in differentiating diseases using only gross signs, and because some aquatic animal disease agents might pose a risk to humans, you should not try to collect samples unless you have been trained. Instead, you should phone your national hotline number and report your observations. If samples have to be collected, the agency taking the call will advise you on what you need to do. Local or district fisheries/veterinary authorities could advise you on sampling. For your national emergency disease hotline number, see Whom to contact if you suspect a disease. These hyperlinks were correct and functioning at the time of publication.